Quietly, without any false fuss, Jane Asher, actress, has arrived. After fifteen years of exits and entrances, Jane has become accepted as an actress. Not as just another pretty young girl to grace a TV screen, but as an actress capable of bringing the screen to life . . . doing a job that no one else could do quite so well. This is Jane Asher's year. We salute her. 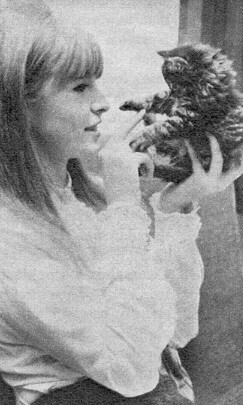 THERE is something very touching and vulnerable about Jane Asher that endears her to the armchair playgoers. She's like a daisy planted among roses. Fresh, delicate and unpretentious. She may be in The Saint, Love Story or in any old kitchen sink drama on TV, but the moment she appears, there is something happening on the screen. She doesn't throw her limbs into theatrical poses or shrill out her lines. There is a quiet strength in her performances that makes them far more memorable than hammy histrionics. She has been acting since she was five years old, and she has learned her craft the hard way, in fifteen years of repertory, radio and TV roles. Jane Asher has the look most big girls envy. Small-boned and fragile-looking she appears just as feminine in over-sized sweaters and sloppy jeans as some poor girl who has spent hours dolling herself up. She has a pale, elfin face, dominated by deep-set blue eyes, rather serious and a little sad. There is a lot happening behind them. Her long hair looks like great flames leaping about her face. She desperately wants to play Joan Of Arc. It was her hair which brought Jane, at five, into the acting profession. She was playing in the park one day with her mother, her younger sister Clare, and her big brother Peter. They all had bright red hair. Someone passing by said they ought to be in pictures or something. The idea appealed to Jane. Soon she was cast as the deaf mute in Mandy. She was Alice. She was Wendy in Peter Pan. And she was Juliet in a children's TV version of Romeo and Juliet. They were all roles that called for a pretty face, a limited range of expressions, and no particular acting ability. 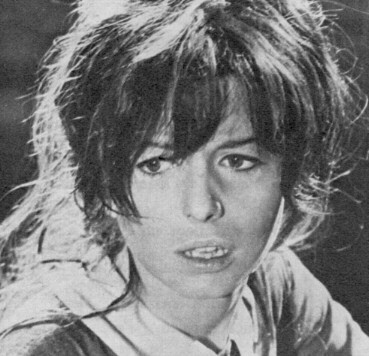 But Jane was attracting the notice of people who had plays to ofer her that would really put her talent to the test. THE supreme test came this year, when Jane played the lead in a new play called Cleo for the Bristol Old Vic Company. She held the stage for two-and-a-half hours playing a mixed-up teenager with a sensitivity unusual in a girl of twenty. Jane took a dozen curtain calls on the first night. People pushed into her dressing-room to shake her hand, and tell her how much they had enjoyed seeing a star born. The star sat on the floor in her shaggy sweater and kneed blue jeans, and calmly drank champagne from a cracked mug. JANE is uncompromisingly down-to-earth and sensible. She can cut through hours of fancy discussion with one simple scentence of logic. It's her ability to seperate the real from the superficial that makes her a good actress. She recently appeared in BBC-2's classic Brothers Karamazov. At the moment, she is appearing with Laurence Harvey, Moira Redmond and Diana Churchill in Shakespeare's A Winter's Tale, at the Cambridge Theatre, London. The play has been selected for study in C.C.E. "A" Level examination next January. Jane hopes that lots of young people will see the play, to prepare themselves. When this production closes - it's the one she appeared in at the Edinburgh Festival - Jane moves into a Broadway play. As we said, jane Asher, actress, has arrived.